With the iPhone 5 now a reality, and plenty of people needing ways to get around, looking to navigation apps is providing those people with a lot of potential solutions. Waze, however, looks to add a little something extra to the experience by incorporation social networking with its navigation. Of course, Waze offers the standards in navigation software–turn by turn directions, estimated time to arrival, and mileage remaining. It offers them up with an unusually cartoony style that may turn some users off, but may well provide a little extra impetus for other users. Where Waze really shines, though, is in its use of social networking to power a lot of extra features that some navigation apps don’t. Some of these functions I’ve actually seen entire separate apps devoted to, so combining them with a GPS navigation app is an even better idea. 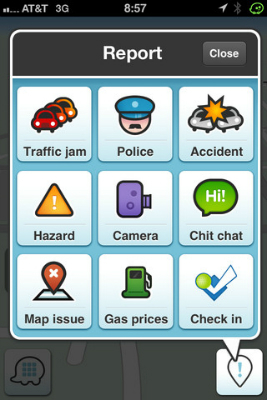 See, what Waze is bringing in is a special set of extras geared toward taking advantage of social networking functions. Users will get access to reporting features for a variety of potential roadway troubles that could be avoided with just a little advance notice. Speed traps are the first for many–indeed, the top center report button is for “police” and the center button is for “camera”, in reference to those automated traffic cameras often found on stoplights. But it’s not just providing a little extra warning for legal hazards, as hazards of a more physical nature are also covered. Ever wish you knew about a traffic jam or an accident up ahead? 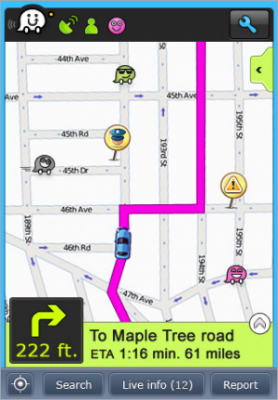 Waze will let you warn other drivers about those problems. Ever been surprised by a bridge rebuilding or road closure? Warn the others! Ever find a good deal on gas prices? Waze will let you put that out too. Waze will then compile all these warnings and display them, clearly and easily, on the turn-by-turn direction maps so that users can immediately tell, at a glance, where cheap gas is, where a traffic jam has developed, where there’s an unexpected hazard in the road and where intrepid police officers–or just intrepid police cameras–are laying in wait, making users’ trips a whole lot safer, simpler, and less expensive. Saving money is generally welcome at most any business, especially if it doesn’t get in the way of actually doing business. Given that Waze is a free app, it should do the job just nicely. Cheap gas, savings on insurance, savings of time and trouble by avoiding accidents, hazards and traffic snarls all add up to time saved and, by extension, money saved. The combination is a powerful one that should be useful at any small business where pennies saved aren’t just pennies earned, they’re vital to the future of the business. But it’s not just savings on travel that help the small business; cloud-based telephony systems can also help to drive profit by improving relationships with customers. Instant conferencing and auto attendants can make the means of getting in touch with a small business a much simpler, much less stressful practice and in turn drive both goodwill and customer dollars into business’ hands. Still, when it comes to being mobile, Waze is likely going to remove more than its share of headaches from small business owners, as well as those employees of same, who need to be out and about.